There are reports that, in the 4th, 5th and 6th centuries, liturgical compositions and musical codices already existed in the Catalan Visigothic church; a catalogue of masses, prayers and hymns – some showing a clear Byzantine influence – that were not preserved. When Catalonia became part of the Carolingian Empire, Roman chant was introduced in its Gregorian form, and Visigothic musical elements disappeared from the year 850 onwards. Between the 9th and 10th centuries, as they adapted to Roman religious services, monks from the monasteries of Ripoll, Sant Cugat, Vic, Barcelona, Girona, la Seu d’Urgell and Sant Miquel de Cuixà wrote, copied and disseminated materials that brought about ecclesiastic and liturgical change using so-called Catalan notation, which was later substituted for Aquitanian notation in the 11th century. Catalonia came to possess more than 100 Gregorian musical codices. Then, in the 12th century, as the catalogue of musical material increased, it became clear that greater accuracy was needed for writing music and so the stave was introduced. At the start of the 11th century, religious music composed for different vocal parts started to come into use. 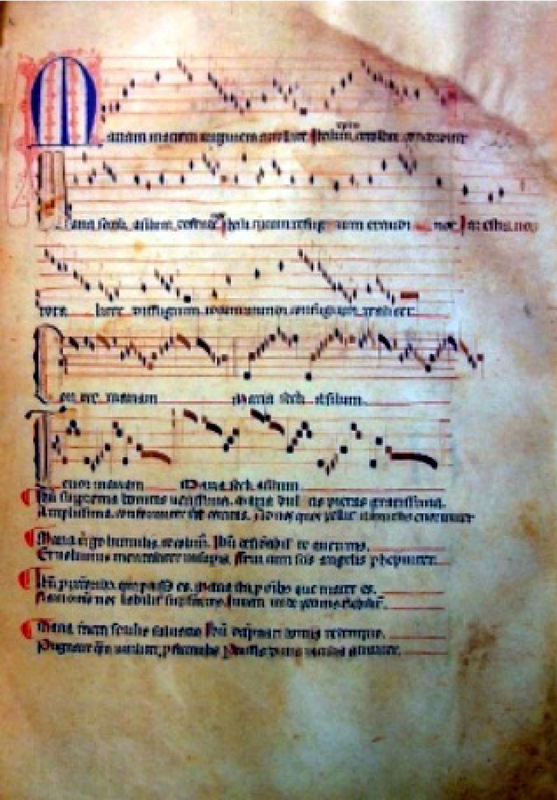 In 1040, Abbot Oliba of Ripoll Monastery copied pieces of music for different vocal parts into a codex. These are the oldest documents on polyphonic music to have been conserved in the West. The integration of polyphony into religious music happened from the 8th century onwards. 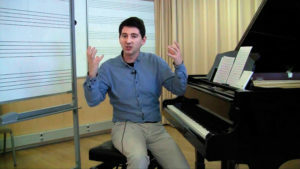 Polyphony in Catalonia mainly consisted of two voice parts over a simple base and rudimentary harmony, very much related to, and influenced by, French polyphony. 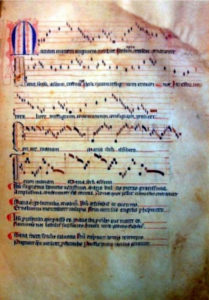 Several pieces of medieval music exist from the 14th century, but the most important one for us today is a codex copied towards the end of that century which is an example of popular religious music: the “Llibre Vermell de Montserrat” (Red Book of Montserrat), named after the colour of its cover. The book contains a number of sermons, prayer exercises and arrangements relating to the worshipping of the Virgin Mary. However, what makes it most important is the “Cançoner Montserratí”: 10 musical compositions dedicated to the Virgin for pilgrims to sing and dance to during their vigils inside Montserrat Basilica. Eight of the pieces are in Latin, one is in Catalan, and another in Occitan. They also offer different musical forms: four are written for one voice, two for two voices, two for three voices, and two are canons. It even includes the only example of sacred dances preserved in Europe. This manuscript heralded the start of the great Montserrat Monastery Choirmasters school; a school which has produced important composers throughout the ages, up to the present day, and a school that we will talk about in a later section. It is important to note that, during the Renaissance, these composers started to compose madrigals and ensaladas and, although this eventually came to an end, the production of choirmasters continued. The most illustrious composers of these styles are Pere Alberch Vila (1517-1582) and Joan Brudieu (1520-1591) for madrigals, and Mateu Fletxa el Vell (1481-1553), Mateu Fletxa el Jove (1530-1604) and Bartomeu Cárceres (16th century) for ensaladas. 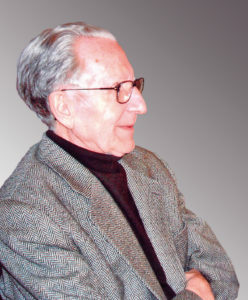 In this era, the music that emanated from the court of the Dukes of Calabria in Valencia is especially notable, with the production of the “Cançoner del duc de Calabria”. In the 16th century, three unique books of polyphonic works were printed in Barcelona: the madrigals of Pere Alberch Vila, some of the motets by Nicasi Sorita, choirmaster of Tarragona, and the madrigals of Joan Brudieu. In the Baroque period, attention should be drawn, amongst numerous other composers of religious music, to Lluís Vicenç Gargallo (c.1636-1682) who composed the Iberian Peninsula’s first two oratorios, Joan Pau Pujol (1570-1626), and Francesc Valls (c.1671-1747). The production of operas began in the 18th century, during the classical era. Composers like Domènec Terradellas (1713-1751), Josep Duran (1726-1802), Carles Baguer (1768-1808) and Ramon Carnicer (1789-1855) were the most noteworthy writers. In the field of religious music a range of composers produced substantial material: Josep Carcoler (1698-1876), Emmanuel Gòmina (1712-1792), Francesc Juncà (1742-1833), Jaume Balius (1785-1822), Joan Rossell (1724-1780) and Francesc Andreví (1786-1853). 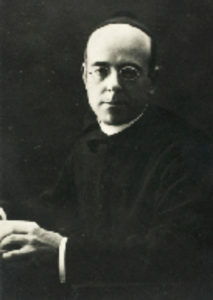 It is important to note the contribution that Josep Anselm Clavé (1824-1974) made in the 19th century as, in addition to creating choral works to bring culture to the working classes, he also bequeathed a repertoire for singing these choruses that was written in a popular, idyllic style, typical of the time, that exalted nature and described customs. Other notable composers from this romantic era are Felip Pedrell (1841-1922), Apel·les Mestres (1854-1936), Antoni Nicolau (1858-1933), Isaac Albéniz (1860-1909), Enric Morera (1865-1942), Enric Granados (1867-1916), Lluís Millet (1867-1941), Amadeu Vives (1871-1932), Pau Casals (1876-1973), Antoni Pérez Moya (1884-1964), Cristòfol Taltabull (1888-1964), Jesús Capdevila (1891-1982) and Robert Gerhard (1896-1970). Robert Gerhard connects with the avant-garde movements of the 20th century that produced a number of composers in Catalonia, such as Eduard Toldrà (1865-1962), Joan Lamote de Grignon (1872-1949), Joan Manén (1883-1971), Joan Samper (1888-1966), Joan Gibert (1890-1966), Agustí Grau (1893-1964), Frederic Mompou (1893-1987), Manuel Blancafort (1897-1987), and Ricard Lamote de Grignon (1899-1962). Amongst many other composers of the 20th century who also have choral works and various harmonisations of traditional and composed songs, some prominent names are Joaquim Homs (1906-2003), Rafael Ferrer (1911-1988), Xavier Montsalvatge (1912-2002), Enric Ribó (1916-1996), Josep Viader (1917-2012), Matilde Salvador (1918-2007), Francesc Vila (1922-2011), Manuel Oltra (1922-2015), Joan Guinjoan (*1931), Xavier Benguerel (*1931), Narcís Bonet (*1933), Jordi Cervelló (*1935), Salvador Pueyo (*1935), Josep Soler (*1935), Josep Prenafeta (1936-2011), Baltasar Bibiloni (*1936), Josep Crivillé (1947-2012), Josep Lluís Guzman (*1954), Salvador Brotons (*1959), Feliu Gasull (*1959), Agustí Charles (*1960), Albert Guinovart (*1962), Xavier Sans (*1962), Poire Vallvé (*1962), Josep Vila i Casañas (*1966), Jordi Domènech (*1967), Xavier Pastrana (*1967), Ramon Humet (*1968), Xavier Pagès Corella (*1971), Albert Carbonell (*1972), Ferran Cruixent (*1976), Oriol Cruixent (*1976), Josep Ollé (*1987) and Pol Requesens (*1990). A musical centre that stood out above all others in Catalonia was Montserrat Abbey. There are musical documents dating from the beginning of the 14th century in Montserrat and, throughout the ages, they have kept up to date with the musical trends of the time and have influenced the country’s religious musical style. The first known musical monks are Jeroni Rotés, Jeroni Castell and Joan Graner in the 15th century. The best composers started in the 17th century with Joan Marc (1582-1658), Pere Roca (c.1610-1651), Jaume Vidal (1606-1689), Dídac Roca, Joan Gelonc (1620-1671), Joan Romanyà (1615-1687), Francesc Rossell (1630-1676), Joan Baptista Rocabert (1657-1701). 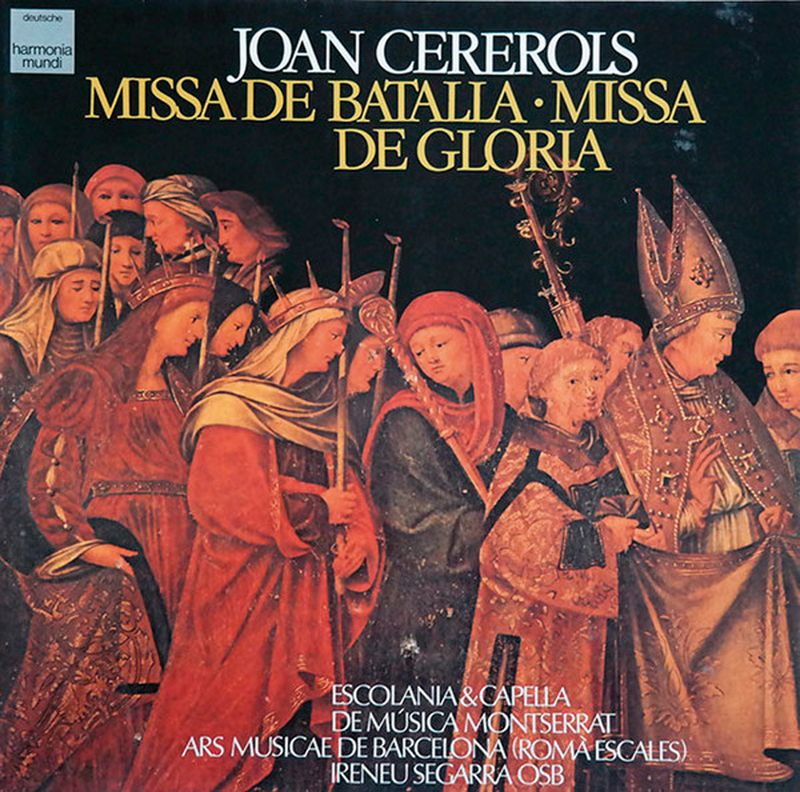 However, the best known and most recognised composer is Joan Cererols (1618-1680) who had a large number of students that were choir masters in the Iberian Peninsula’s principal churches, and who continues to be one of the most performed musicians with an extensive catalogue of works. Miquel Pujol, Joan Garcia, Miguel López (1669-1723) and Benet Soler (1640-1682) should also be mentioned from this era. Entering into the 18th century and the classical period, the first reformist was Josep Antoni Martí (1719-1763). His students Anselm Viola (1738-1798) and Narcís Casanoves (1747-1799) were the main composers. We should also mention Antoni Soler (1729-1783), Josep Vinyals (1772-1825), Benet Brell (1786-1850), Jacint Boada (1772-1859) and Ferran Sor (1778-1839). 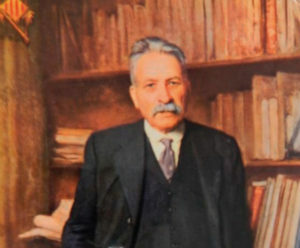 With regard to the 19th century, Manuel Guzman (1846-1909) is certainly the stand-out composer, and then, in the 20th century, we can note Àngel Rodamilans (1874-1936), Anselm Ferrer (1882-1969), Ireneu Segarra (1917-2005), Gregori Estrada (1918-2015) and, more recently, Bernat Vivancos (*1973), who has been both a member and director of the Escolania boys choir.